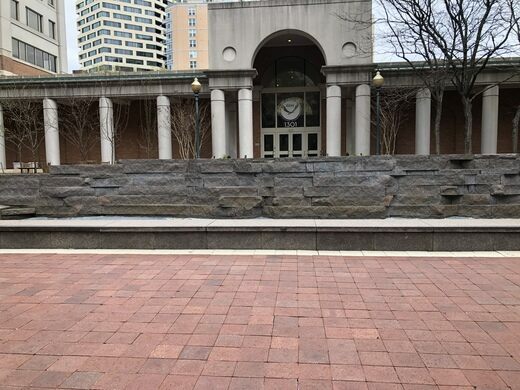 Live data is transmitted from the Atlantic coast to instantly recreate the ocean waves in this fountain at the NOAA headquarters. Approaching the wave pool sculpture outside the National Oceanic and Atmospheric Administration (NOAA) headquarters in Silver Spring, Maryland, you will see waves crashing against rough-cut granite, rhythmic and mesmerizing, in various levels of ferocity and grace. An astounding collection of medical specimens, including bits of President Lincoln. Brain collection and database that narrows the gap between man and animal. What most people don’t realize is this sculpture, called “Coastline,” is much more amazing than its appearance lets on. These aren’t just random waves, but rather are generated from real-time wave measurement data transmitted from the Massachusetts seacoast to instantly recreate the exact ocean waves along a 65-foot section of the Atlantic coast. When the artist Jim Sanborn created this wonderful wave pool in 1993, he connected it remotely to a sensor on the coastline. The artificial waves are generated by a turbine under the sculpture, while their movement is controlled by the data transmitted from the tide gauge in the town of Woods Hole, Massachusetts. The effect is a precise, real-time replica of the Atlantic surf (at one-fourth the size) right outside the NOAA Science Center. Many locals walk their dogs past the fountain, eat their lunches on one of the benches, or use it at a convenient meeting place after work, but few casual observers realize the remarkable secret science behind its rolling waves. The fountain has benches and a little garden area around it, but not much parking. Your best bet is to take the bus or metro to the area and walk around from there. A tribute to the beloved, kind-hearted "homeless mayor" of Silver Spring. A benevolent, 16-foot-tall river dragon lives on a suburban lawn. A diminutive plaque recalls the treetop sniper who almost killed Abe Lincoln. These expertly crafted, scientifically accurate glass sea creatures were once an international phenomenon. This unusual lava tube spouts seawater during high surf.